Butter and Margarine, both fat/oil based spreads that people use daily on their sandwiches, toasts and in cooking. The world and the internet is full of information on both of these foods, their health claims, which is better for you and why you should avoid the other! I've taken the time to cut through the noise, break it down simply and let you decide what option you would like to put in your belly. In this blog post I will cover off what butter and margarine are, how they are made and the options that you will find out there in the supermarket. For those who are avoiding both butter AND margarine, I will also cover off some of the “good oil” for dairy-free, vegetable oil-free spread options. My approach is not to tell you what to do, but rather give information for you to make an informed decision about what is best for you. One thing to keep in mind is this, how many steps away from nature is what you are eating? Butter is a product created from animal milk fats, it can be made from cow, goat, sheep or buffalo cream. Discovered over 6000 years ago, butter is made in a two step process from cream (the milk solids), agitated to seperate the butterfat from the buttermilk, then patted to remove excess buttermilk. Sometimes the butter is salted to allow better preservation. It is commonly used in cooking, both as an oil and as an ingredient, as well as a spread for sandwiches and toasts. Butter has several derivatives, whey butter (butter made from whey cream), cultured butter (butter made from fermented cream), raw cream butter (the most common butter, made from fresh cream), and clarified butter (butter that has most of the water and milk solids removed, for example ghee). Margarine, first created in 1813, is generally made up from vegetable oils and fats, emulsified and modified using a range of techniques, fractionation (an isolation process), interesterification (a blending process that modifies the triglycerides) or hydrogenation (a treatment with hydrogen that fundamentally changes the structure of the fats). 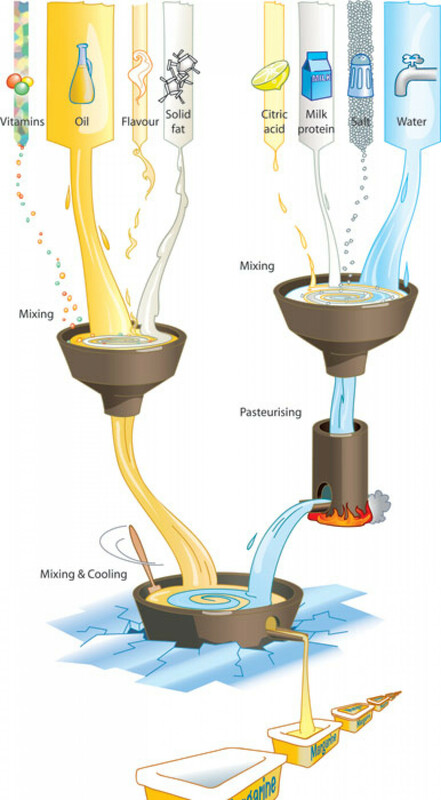 Simplified, margarine is manufactured using a multistep process that is hard to replicate in the kitchen, only replicable in a lab manufacturing environment! The types of margarine available on the market include soft vegetable fat spreads (generally hydrogenated and combined with preservatives, artificial vitamins and carotenoids e.g. sunflower or olive oil spreads), liquid margarine (for cooking) and hard margarine (uncoloured margarine, e.g. shortening). At this point, it becomes clear which one of these are whole food, and which one is manufactured in a complex process. I want to dive deeper into what makes margarine, and the differences in dairy butters. Not all dairy butters are created equal. Normal: normal butters are the main option at supermarkets, these are generally non-organically farmed dairy butters, the milking cows are fed on a combination of grain feed and some pasture feeding. These cows can have their feed supplemented (with grains, added vitamins and minerals etc), and due to the nature of their milking system can also be exposed to antibiotics (although in Australia if a cow is given antibiotics the milk is not allowed for human consumption). In Australia growth hormones are also banned for use in the dairy industry. Grass-fed: Most Australian dairy cows are grass fed to an extent, depending on their location, grass stocks can run low in Winter months. Some herds have their feed supplemented with dry grasses and grains. Almost ALL dairy cows consume grains during the milking process as a treat encourage them to self-herd to the milking stables. The more grass eaten by the dairy cows results in improved nutrition, and in turn these results are shown in the milk/cream/butter a herd produces. Grass fed butters tend to be yellower with higher levels of natural beta-carotene. Cultured: Cultured butter is butter that is made on cream that has been fermented, resulting in a tangy flavoured butter. Fermented dairy products tend to be easier to digest, as the fermentation breaks down the harder to digest lactose in dairy products. Cultured butter also tends to have a higher milk-fat and lower moisture content. Cultured butters are hard to find, although most farmers markets in Australia will have a butter vendor who stocks cultured butter. The Pepe Saya brand can be sourced at Get Fresh Cotton Tree. Organic: Organic butter uses cream sourced from certified organic dairies, these farms are farmed organically, using no pesticides, no hormones and no antibiotics. Organic farming nurtures the soil, increasing bioavailability of nutrients in the soil for the pastures (and therefore the cows through their diets). Australian Certified Organic, the leading organic certifier in Australia requires all cows to have a diet that consists of at least 70% of their diet made up of organic grass-based feeds. Therefore it could be implied that organic butters could be classified as grass fed butters. Certified organic products provide certification guarantee that a product is chemical free and grass fed. Organic Dairy Farmers and Organic Times are the leading certified organic butter brands in Australia. Avocado - a delicious healthy fat alternative for spreading on toasts and sandwiches! Dips for flavour - I use home made dips as spreads on my breads, hummus is a fave of mine, as well as my basil/coriander pesto! Miso paste (an awesome Vegemite replacement!). I like to keep things simple in the kitchen, I love my 3 ingredient easy-make vegan butter! Tasty, buttery in colour and flavoured to me liking! Add herbs and spices to season it to your liking. Blend the three ingredients in your food processor/blender, whipping the oils into a yellowy-white blend, pour the blend into a container and pop in your fridge for ready to use butter! You can also add some sunflower oil to make the mix a little more liquidy - although this tends to seperate from the thicker oils. Blending whips air into the mix, making it fluffy and softer once refrigerated. Another way to make this mix is to double boil the cacao butter and coconut oil until it is liquid and then mix together while adding the salt - then pour the liquid into a container and pop in the fridge! This will be a denser version, but still just as tasty! For ease of use, let the CocoCaca sit out at room temperature, making it easier to spread.